Hosted by the Sanya Municipal Government, and jointly undertaken by the Sanya Commission of Tourism Development and Sanya Sports Bureau of Culture, Radio & Television Publication, the 7th China Sanya Spring Dragon Festival (Long Tai Tou Jie) will be held at the Sanya Xiaodongtian Tourism Spot on 6th March, 2011. The blessing will be held at 10:10am on 6th March 2011, at the Da Xiao Dong Tian Long Wang Square. 2. Lecture about how to preserve one’s health. 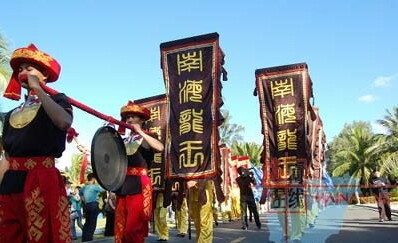 There will be Hainan snacks, Hainan folk arts and Hainan unique clothes at the fair. Apart from that, a photography show about the Hainan Sea Sacrificial Ceremony will be held that day.